Part I: They have a lot in common with Ron Paul supporters. Bernie Sanders at a campaign stop at the Pinkerton Academy Stockbridge Theatre on Monday in Derry, N.H.
MERRIMACK, N.H. — Perhaps the most eye-popping statistic to come out of last week’s Iowa caucuses was Bernie Sanders’s overwhelming advantage among young voters. According to the Iowa entrance poll, Sanders beat Hillary Clinton 84 percent to 14 percent among Democrats aged 171 to 29. He also won voters aged 30 to 44 by a 21 percentage point margin. But Clinton easily won among voters aged 45 and older, allowing her to essentially tie with him in the state. Pre-election polls in New Hampshire suggest that the age divisions in the Democratic electorate could be at least as dramatic here. These differences are really something. In 2008, Barack Obama performed better than Clinton among younger Democrats, but not by nearly the margin that Sanders won them in Iowa. And although generational affinity might have explained some of Obama’s success with young voters — Obama was 46 years old at the time of the 2008 primaries — it doesn’t work for the 74-year-old Sanders, who is six years older than Clinton. Bernie Sanders proudly describes himself as a “socialist” (or more commonly, as a “democratic socialist”). To Americans of a certain age, this is a potential liability. I’m just old enough (38) to have grown up during the Cold War, a time when “socialist” did not just mean “far left” but also implied something vaguely un-American. If you’re older than me, you may have even more acutely negative associations with “socialism” and may see it as a step on the road to communism. If you’re a few years younger than me, however, you may instead associate “socialism” with the social democracies of Northern Europe, which have high taxes and large welfare states. Sweden may not be your cup of tea, but it isn’t scary in the way the USSR was to people a generation ago. 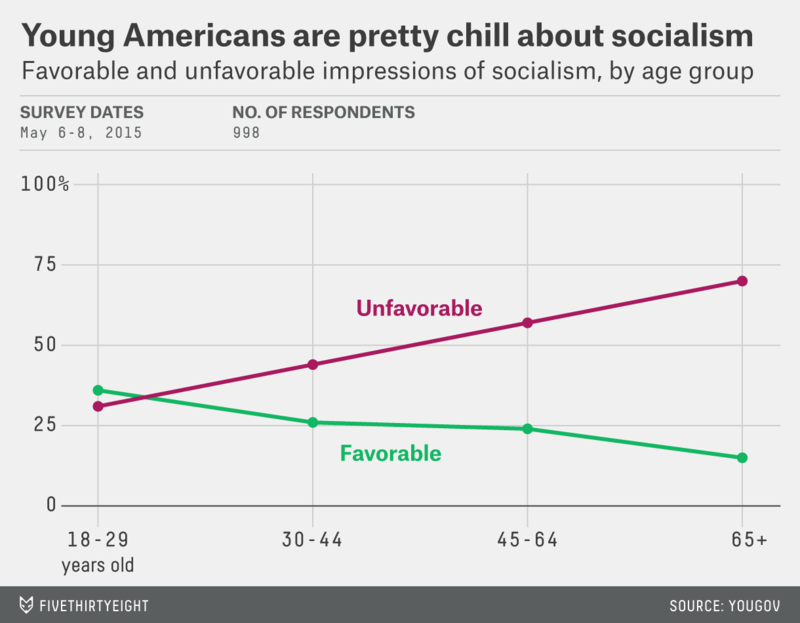 Indeed, views of socialism are highly correlated with a voter’s age. According to a May 2015 YouGov poll, conducted just before Sanders launched his campaign, a plurality of voters aged 18 to 29 had a favorable view of socialism. But among voters 65 and older, just 15 percent viewed socialism favorably, to 70 percent unfavorably. That doesn’t mean America is undergoing a leftist or revolutionary awakening, however. The biennial General Social Survey has a long-standing question about wealth redistribution, asking Americans whether the “government in Washington ought to reduce the income differences between the rich and the poor … perhaps by raising the taxes of wealthy families or by giving income assistance to the poor.” While no one question can summarize Sanders’s left-of-center economic program in a sentence, this is probably about as close as you’re going to get; his plan would raise marginal tax rates to as high as 77 percent on the very richest Americans to pay for a host of social programs. The General Social Survey question asks respondents to place themselves on a 7-point scale ranging from favoring government efforts at redistribution to opposing them. To make things a little more intuitive, I’ve translated those responses to a 100-point scale, where 0 represents the most conservative/right-wing position (no redistribution! ), and 100 the most liberal/left-wing position (hell yes, redistribution!). The chart below summarizes how both Americans overall and Americans aged 18-29 have responded to the question over time. Americans end up pretty much in the middle of the road.3 Whereas 50 would represent an exactly centrist position, the average score among all Americans in 2014 (the most recent edition of the survey) was 54. Americans aged 18-29 scored a 60, just slightly further to the left. But these are really modest differences, and they haven’t changed much over time. In 1996, 20 years ago, the average response among all Americans was a 54, and the average among Americans aged 18-29 was a 59, almost exactly the same as now. It’s possible that Sanders will trigger a shift toward more support for economic redistribution in the future, but there hasn’t been one yet. The cynical interpretation of this is that the appeal of both “socialism” and “libertarianism” to younger Americans is more a matter of the labels than the policy substance. Relatedly, it’s hard to find all that much of a disagreement over core issues between Clinton and Sanders, who voted together 93 percent of the time when they were both in the Senate from 2007 to 2009. But terms such as “liberal” and “conservative” are fairly cynical also, at least in the way they’re applied in contemporary American politics. Rather than reflecting their original, philosophical meanings, they instead tend to be used as euphemisms for the policy positions of the Democratic and Republican parties, respectively. Those parties’ platforms are not all that philosophically coherent, nor do they reflect the relatively diverse and multidimensional political views of individual Americans. Instead, the major American political parties are best understood as coalitions of interest groups that work together to further one another’s agendas. What’s distinctive about both the Sanders and Ron Paul coalitions is that they consist mostly of people who do not feel fully at home in the two-party system but are not part of historically underprivileged groups. On the whole, young voters lack political influence. But a young black voter might feel more comfortable within the Democratic coalition, which black political leaders have embraced, while a young evangelical voter might see herself as part of a wave of religious conservatives who long ago found a place within the GOP. A young, secular white voter might not have a natural partisan identity, however, while surrounded by relatively successful peers. In part, then, the “revolutions” that both Sanders and Paul speak of are revolutions of rising expectations. We’ll explore this theme more fully in Part II of the series, and consider some alternative explanations for Sanders’s success. Check our our live coverage and results from the New Hampshire Primary elections. 17-year-olds are eligible to vote in the Iowa caucuses provided that they will be 18 by Election Day in November. Or maybe later this week, but let’s underpromise and overdeliver. Although they’re just a smidgen closer to the left than the right. Paul’s and Sanders’s strong performances with low-income voters may be mostly a reflection of their support among young voters, since younger voters tend to make less money. 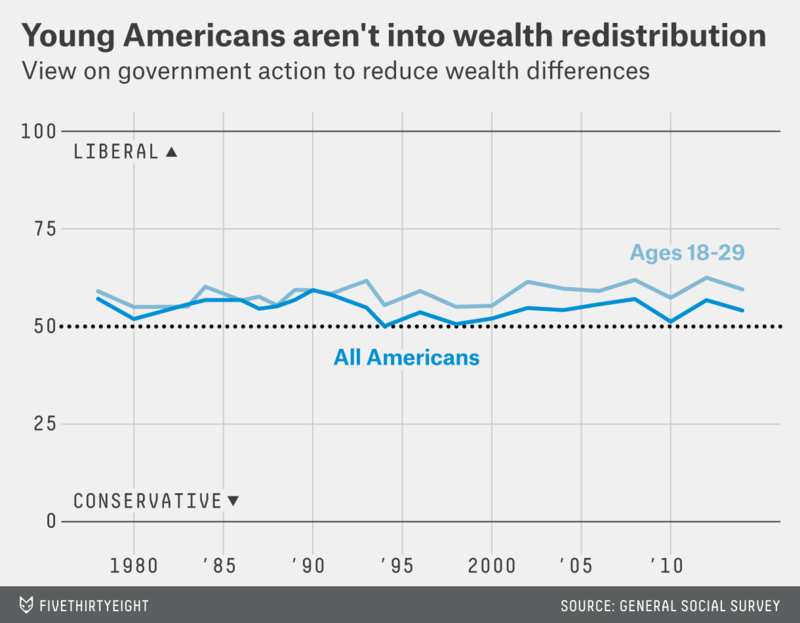 In statistical terms, younger voters had a slightly smaller standard deviation on the wealth redistribution question.